Phosphorus is an essential element for crops, especially in the spring because it stimulates early plant growth, giving the plant a healthy and vigorous start. Spring phosphorus availability can range from low levels in western Minnesota to high levels in the southeastern, central and east-central areas of the state. Here’s a look at how to manage phosphorus this spring, based on the latest research. One of the main roles of P in living organisms is in the transfer of energy. Organic compounds that contain P are used to transfer energy from one reaction to drive another reaction within cells. Because adequate P availability for plants stimulates early plant growth and hastens maturity, keeping the concentration of available P in soils at adequate levels is important. The easiest way to increase the concentration of available P in soils is by the addition of fertilizers that contain P, like MAP and DAP. These fertilizers are highly soluble - about 90 percent of the total P is soluble in water. As those fertilizers are added to soil, moisture will start to dissolve the fertilizer granule and P will move toward the soil solution, increasing the amount of P that is available for plant uptake. Soil available P will be at its highest concentration when all of the added fertilizer has been dissolved. The soil will maintain that level for about two weeks. After that, the levels of available P in the soil will start to decrease due to the chemical reactions that happens between P and soil including clays particles, organic matter and microbial growth. When adequate fertilizer is added, the available P pool in the soil will continue to contribute to optimum plant growth until the end of the summer. Therefore, to increase the potential availability of P, apply fertilizers as close to planting as possible. Many people apply phosphorus in the fall, due to timing and convenience, but spring application is an effective option as well. Research has shown that seasonal timing (fall vs. spring) has little effect on P availability due to its limited mobility in soils. Changing management of P fertilizers, such as banding, is the most effective way to keep P available to the plant. Soils throughout most of western Minnesota can have low P availability because of large amounts of calcium in soils. Soil high in calcium may require different management to maintain greater availability of P for crops. Management options for soils high in Ca may include banding or more frequent broadcast applications of P to ensure P is available for crops. The ability of banded fertilizer to supply all of a crop’s P requirement can depend on the type of band used and the soil test. Banding liquid fertilizer on the seed is common for corn and sugarbeet. Use low rates when banding on the seed to avoid reduced emergence due to high salts or ammonia formation near the seed. 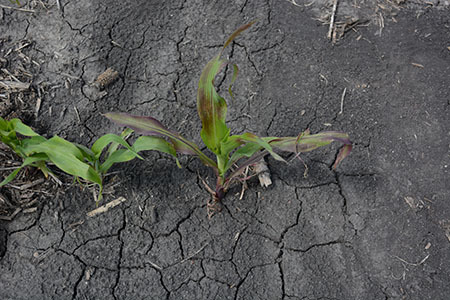 A low rate of phosphate banded with the seed can provide maximum yield for corn at a medium soil test, but is not enough to maximize yield when soil P test low. In contrast, recent data has shown that a low rate of fertilizer banded with the seed is better than higher rates of broadcast P for sugarbeet. The most important decision-making factors for P management are the amount of P applied and the price of fertilizer. Use a soil test to guide the amount of P you apply. In general, crops are more likely to respond to P addition when the Bray soil test is between 0 and 15 ppm or the Olsen soil test is between 0 to 11 ppm. The timing of your P application, whether fall or spring, should be determined by fertilizer prices and the field conditions. Remember that MAP or DAP fertilizers also have significant amounts of N, so consider the potential for N loss with fall applications of these fertilizers. This post was originally featured in The Farmer magazine.